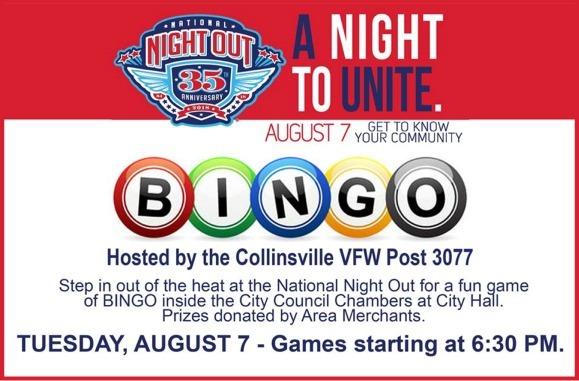 The City of Collinsville is excited to be participating in the National Night Out campaign for the first time this year. 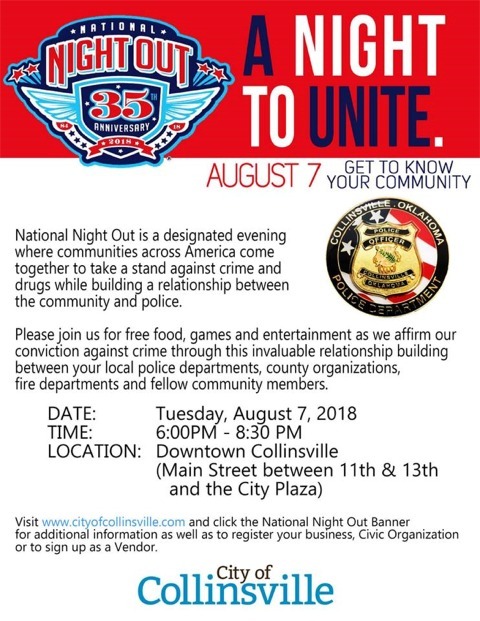 National Night Out is a designated evening where communities across America come together to take a stand against crime and drugs while building a relationship between the community and police. Please join us for free food, games and entertainment as we affirm our conviction against crime through this invaluable relationship building between your local police departments, county organizations, fire departments and fellow community members. The event is planned to take place on Main Street between 11th and 13th Street and in the City Plaza from 6:00 PM  8:30 PM. We will have lots of family activities and games going on with a live DJ interacting with the crowd. 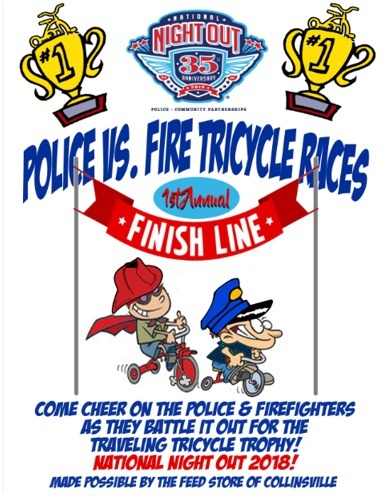 We will have fun challenges between the Police and Fire departments. There may or may not have even been talk of a certain lip sync challenge possibly taking place. There will be FREE hot dogs, chips, and water too! Please feel free to share the attached flyer with everyone you know. Attached is also a .jpg file to share online. There is also a registration page for area churches and organizations to sign-up to be a part of the event by hosting fun family games or activities. See our website for more information and to register your business, organization or church. There is also a Facebook event for everyone to R.S.V.P. to and share, share, share. Please help us get the word out! We will be posting updates on the event on our Facebook Event and the City Facebook Page as they become available. Thank you all for helping us support our law enforcement and public safety departments! Well see you at the NNO event on August 7!